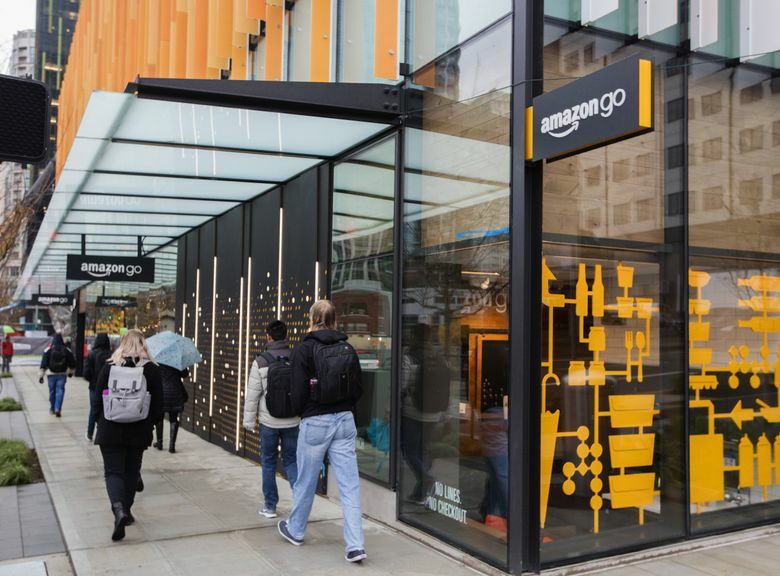 The tech giant has built a convenience store in downtown Seattle that deploys a gaggle of technologies similar to those used in self-driving cars to allow shoppers to come in, grab items and walk out without going through a register. The 1,800-square-foot store, officially dubbed “Amazon Go,” is the latest beach in brick-and-mortar retail stormed by the e-commerce giant, which already has bookstores and is working on secretive drive-thru grocery locations. It’s clearly a sign that Amazon sees a big opportunity in revolutionizing the staid traditions of Main Street commerce. In the much longer term, if the experiment works out and is adopted widely, it could radically transform the nature of work in the retail industry, much like driverless car and truck technology threatens to upend transportation. The Bureau of Labor Statistics says that cashiers are the second-largest occupation, with 3.5 million employed in the U.S.
Analysts with Cowen say the move shows how aggressively Amazon is pursuing the grocery business, which represents about 17 percent of total U.S. retail, or nearly $800 billion. It’s an area dominated by Wal-Mart, an Amazon rival that is revving up its e-commerce game. For Amazon, it represents a huge source of potential revenue growth, plus another way to ensconce itself in people’s shopping habits. While more and more people, especially among the younger cohorts, are going online for their groceries, “we acknowledge some people may never be comfortable with the idea,” say the Cowen analysts. Amazon shares closed up 2.57 percent on Monday, trading at $759.36 and widely outperforming the market. The Wall Street Journal has reported, citing people familiar with the matter, that success in its experiments could lead Amazon to open more than 2,000 brick-and-mortar stores in various formats. Amazon declined to comment on those plans. Amazon could get even more bang for its revolutionary technology, perhaps, by selling it to other brick-and-mortar retailers, Sebastian said. After all, Amazon provides cloud computing, payment and even e-commerce platform services to retailers that otherwise compete with it. The Amazon Go store is at the corner of Seventh Avenue and Blanchard Street, in the new Day One tower that lies at the center of Amazon’s new downtown campus. It’s right next to where Amazon’s “biospheres” are going up. The store is open to those employees of the tech giant participating in a beta testing program. At lunchtime Monday, the sidewalk outside the place was crowded with those participants, clutching orange bags. The store is expected to be open to the public in early 2017. Shoppers walking into the store call up the Amazon Go app and hold their smartphone to a scanner as they would at an airport security line. That opens a gate. Then they just pick any combination of products and walk out. Amazon charges them after they leave the store. Unlike the self-serve registers present at many supermarkets, there’s no need to stand in line or go through any register. The store features ready-to-eat meals and snacks prepared by on-site chefs or local bakeries. There are also essentials such as bread and milk, as well as high-end cheese and chocolate. Amazon says there will be well-known brands as well as “special finds we’re excited to introduce to customers.” That includes an “Amazon Meal Kit,” which contains ingredients needed to make a meal for two in 30 minutes. The digitalization of brick-and-mortar stores has taken gradual steps in the past few years. One example is Starbucks, a global retail empire that’s been banking on an increasingly robust smartphone app to lure consumers into its loyalty program and payment system. “Elements of these technologies have existed for a while. But building a store that’s based around it is a very interesting concept,” said Tom Coughlin, president of data storage consulting firm Coughlin Associates and a senior member of the Institute of Electrical and Electronics Engineers. He thinks, however, that human troubleshooters will be, at least for a while, a critical part of the shopping experience. “It’ll be interesting to see how well it works not having anybody there,” he said. In a blog posting, Neil Stern, an analyst with retail consultancy McMillan Doolittle, wrote that Amazon Go was a “game changer for the retail industry” at a time when labor costs are increasing.